Welcome to The People’s Critic’s News and Commentary Page. Check back here often for my take on all things related to the movies. 2013 has been another great year for movies. While films with numbers in their titles like Iron Man 3, Despicable Me 2, Hunger Games 2, Fast & Furious 6, Star Trek 2, Thor 2, The Hobbit 2, Grown Ups 2, Cloudy With a Chance of Meatballs 2, Monsters Inc. 2, The Hangover III, not to mention Man of Steel (aka Superman 6) continued to rule the box office, the quality of films released this calendar year has once again been excellent. Oscar nominations will be announced Thursday, January 16th, but once again – a more important announcement is being made right now. While no Top Ten List can ever satisfy everyone, great care has been taken to analyze each film on a particular set of criteria ensuring reliability! 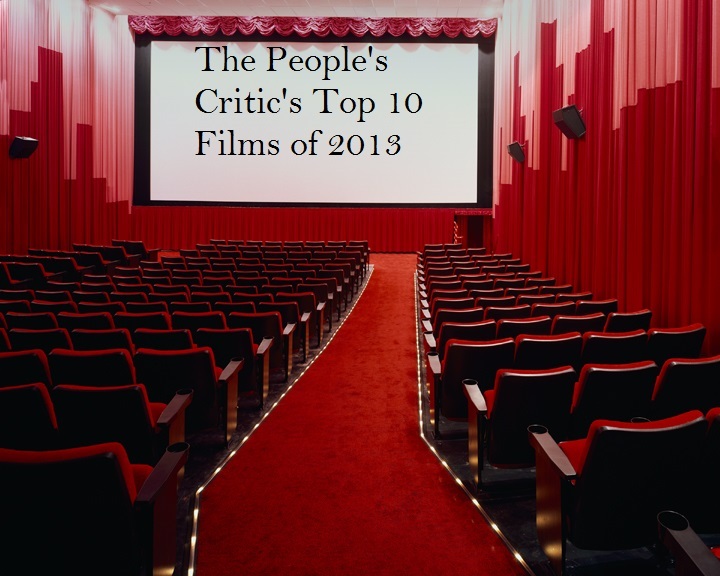 So without further ado, I present The People’s Critic’s Top 10 films of 2013. 10. The Hobbit: The Desolation of Smaug – Peter Jackson’s first effort in the Hobbit trilogy made this list last year, so it seems fitting that its superior sequel finds a place on the list for 2013. There is more action, more humor, higher stakes, and purposeful character development in this film. The Desolation of Smaug is an exciting, beautiful, and thrilling film with plenty of excitement for any moviegoer or film lover. 9. Captain Phillips– While the story is still relatively current and many film-goers will be aware of its outcome, director Paul Greengrass, actor Tom Hanks, and a remarkable supporting cast ensure a thrilling experience. The film also works on a deeper level by examining the motives of the pirates and theorizing about some of the policies that should, perhaps, be revisited regarding freighter security measures and the “acceptable” risks that are taken for the sake of transporting goods overseas. The film resonates with vivacity but Hanks’ performance is the film’s true strength. 8. The Wolf of Wall Street– Martin Scorsese and Leonardo DiCaprio team up for the fifth time with the goal of exploring morally bankrupt people who fill that void with the greatest drug of all, money. The result is a film that has polarized audiences, but the ambitious cinematic tale of excess is a conversation starter in the midst of a year of mostly “safe” films that do not challenge the audience’s sensibilities. 7. Mud– While some movies that Matthew McConaughey is in are great, few movies are great because Matthew McConaughey is in them. This year, numbers 8 and 7 on my list of the best films of the year feature McConaughey in roles that actually do make their respective movies greater. Incidentally, McConaughey also gained much attention for his role in Dallas Buyers Club, so it’s been a banner year for him. Mud is a strong film about the unlikely relationship between an escaped convict and a young boy in the style of Mark Twain’s The Adventures of Huckleberry Finn. Writer/Director Jeff Nichols is able to weave in significant observations about fatherhood, childhood, love, and respect and make a film that is a sharp and relevant slice of Americana. 6. Pacific Rim – Guillermo del Toro continues his hitting streak by accomplishing the very thing that has seemingly puzzled Gore Verbinski and Michael Bay for years: creating a wildly epic action film that isn’t clunky, irritating, or devoid of excitement. Pacific Rim is not just a film about giant alien monsters fighting massive robots…well, it is, but Travis Beacham’s script develops the characters and not just the action. Furthermore, del Toro’s directing makes sure we care about each battle and understand what’s at stake at every turn. 5. Iron Man 3– Summer blockbusters rarely make appearances on Top Ten lists, but this year is quite the exception. This year’s highest grossing film is also this year’s fifth best film of the year. Iron Man 3 represents the eighth spectacular achievement in the Avengers vein by Marvel studios as they revolutionize the concept of the film franchise. The cinematic universe that Marvel studios has created achieves a detailed serial nature usually reserved for complex television dramas. The success of these films is often attributed to their effects and unyielding action. Nevertheless, the greatest titles, Iron Man 3 being one of them, deserve their status because of clever writing and character development. 4. Gravity– Superlatives abound when describing the intensity and the mind-blowing visual effects of Gravity. It is a true cinematic ride – absorbing, terrifying, and authentic. Clooney and Bullock carry the movie with ease and with a tight running time of 91 minutes, the small cast merely emphasizes the ironically claustrophobic nature of space. 3. Prisoners – Prisoners is an outstanding mystery/thriller that manages to sustain its tension right to the last second. With a gripping tone reminiscent of Silence of the Lambs, Prisoners does a phenomenal job walking the tightrope between drama and revenge thriller. Jackman offers up another powerhouse performance as a father whose daughter is kidnapped and who must wade through some morally murky waters in his quest to get her back. 2. Blue Jasmine – Blue Jasmine is Woody Allen’s 41st film as writer/director in as many years. The always reliable, always prolific auteur has earned the respect of The People’s Critic as a living legend, and the Brooklyn-born neurotic genius shows no signs of running out of steam at the age of 77 with Blue Jasmine being one of his most insightful and finely-tuned films of his career. A frontrunner for best actress, Cate Blanchett plays Jasmine French, a modern American socialite who suffers a life crisis when her financial investor husband turns out to be a white-collar crook in the vein of Bernie Madoff. Blue Jasmine utilizes Allen’s broad knowledge of literature and film and explores a whole range of moral ambiguities while accomplishing the difficult task of combining comedy with drama. 1. 12 Years a Slave – Last year, the film that topped this list was Quentin Tarantino’s outrageous American slavery period bounty hunter Western, Django Unchained. This year, the film that tops the list is that film’s much more mature and grown up grandfather, 12 Years a Slave. 12 Years a Slave is a moody masterpiece. Director, Steve McQueen contrasts the most abhorrent events of our young country’s history with some beautiful filmmaking, glorifying the Southern landscapes in rich, luscious irony. His camera is up close and personal, using countless close-ups with the clear objective of putting slavery “in your face.” The emotion is real and raw, not melodramatic. It is a history lesson of the best and worst kind. Honorable Mentions – Films deserving honorable mentions are 42, The Hunger Games: Catching Fire, Saving Mr. Banks, The Spectacular now, The Conjuring, The Bling Ring, Star Trek: Into Darkness, and Fruitvale Station. On an ANGRY side-note – Year after year, films vying to qualify for Oscar eligibility will open their films in the minimal markets (LA and New York) and then choose some obsequious and noncompetitive weekend in January to open wide to audiences. Last year the film most guilty of this is the controversially acclaimed Zero Dark Thirty, which went on to win exactly one Oscar – and that was in a tie for Best Sound Editing! Nonetheless, this stupid phenomenon continues to persist. Films like Spike Jones’s Her, The Coen Brothers’ Inside Llewyn Davis, and August: Osage County all opened in minimal markets and will open wide later in January. I continue to champion that films should have to be widely released in the year that they wish to be nominated. Audiences should have access to all academy qualified films and an opportunity to share their points of view before the “so-called” powers that be cast their votes. The films listed above all played fair and deserve to be seen and commended…. 5. Safe Haven – Formulas exist because they provide the framework for pleasing an audience, but unfortunately they grow tremendously stale and unsatisfying if they are not tweaked and modified from time to time. This was a lazy movie from start to finish, and it is an apparent Valentine’s Day cash-grab at a movie hungry audience looking for a romantic film during a barren movie season. 4. Anchorman 2: The Legend Continues – In a year full of sequels, none were as disappointing as this follow up to 2004’s Anchorman: The Legend of Ron Burgundy. The jokes are stale this time around and mostly feel like amateur improv. Farrell and company take the more is more approach this time and it’s a disaster that not even a scene of fist to fin combat with a shark can save. 3. A Good Day to Die Hard – I wasn’t going to review A Good Day to Die Hard when I first saw it. Then I thought some people might try and see it, and if I could have stopped them, I could never forgive myself as a critic. I said above that Safe Haven was a lazy movie, but it is nothing compared to his awful entry in the Die Hard franchise. The wheels fall off of this one immediately and while I think there is still gas in the tank for Die Hard as a series, this one should be completely forgotten. 2. The Internship – The Internship is basically a thinly veiled advertisement for the virtuosity and distinctiveness of Google. Unfortunately, for the average paying theater-goer, the film is not as innovative as its subject. Vaughn and Wilson are both awkward and unfunny throughout not because they don’t have chemistry, but because they don’t have a good script. 1. Only God Forgives – Director Nicholas Winding Refn has created a small and weird film in Only God Forgives. Essentially what we have here is a cold-hearted revenge film where one murder begets one more. Scenes composed of people simply moving around and a main character who says maybe 15 words total is a recipe for a bland and violent film. Only God Forgives appears to be an instrument for Winding Refn to release his own personal anger against spirituality, against God, against mothers – it’s an angry film and not a good one. 10. 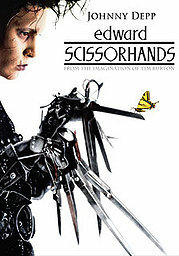 Edward Scissorhands – Now hold on there! Edward Scissorhands, a holiday film? 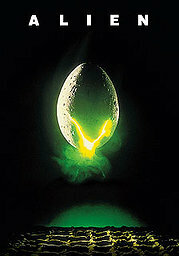 The film was released December 19, 1990. It also has Christmas scenes and a beautiful “snow” motif. But most importantly, it is a film about accepting differences – even if those differences involve robotic-like anatomy linked to scissor appendages. Tim Burton’s masterpiece fits nicely under the holiday-guise and is a gothic allegory for society’s corruption! 9. The Ref – Denis Leary strives for the main stream in director Ted Demme’s hilarious film about a cat burglar who takes the wrong couple hostage as he attempts to evade the police on Christmas Eve. 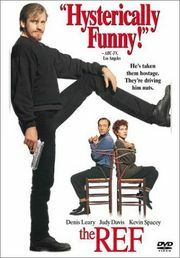 Leary finds himself the victim as his husband/wife hostages continuously drive him nuts with their bickering and fighting. 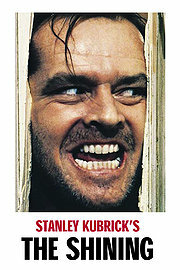 Kevin Spacey and Judy Davis are delightfully venomous as the couple and Leary is in fine form as the tortured criminal! 8. 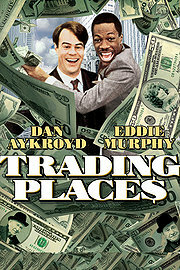 Trading Places – Based on a rather high-brow social experiment, Trading Places finds the lives of socialite Dan Aykroyd and street-bum Eddie Murphy suddenly switched as part of a wager between two rich CEOs. The nature vs. nurture wager revolves around whether Aykroyd will resort to crime when he loses everything and whether Murphy will become a responsible executive when given opportunity. As serious as this may sound, the movie is a triumph of the comedy legends. 7. 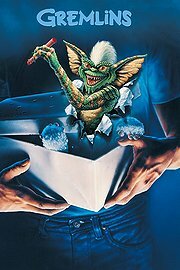 Gremlins – “No bright light, don’t’ get him wet, and whatever you do – don’t ever feed him after midnight.” These are the three rules that are sure to be broken when Randall Peltzer brings his son Billy home a strange new pet for Christmas! In no time Gremlins are unleashed on Kingston Falls. In the same vein as Edward Scissorhands, this film dances the line between horror and comedy with great results. A classic! 6. 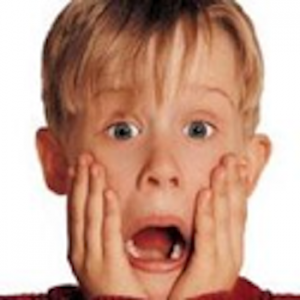 Home Alone – We all have Macaulay Culkin’s shocked face frozen in our cerebral cortex from when he slapped on too much aftershave. 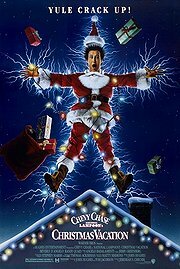 However, John Hughes’s Christmas blockbuster is both a holiday film as well as a solid entry in the Hughes tradition. Even with an 8-year-old protagonist, Hughes doesn’t let up on the youthful angst, creating a coming of age story wrapped up with a nice bow (and a few black eyes for those wet bandits). 5. 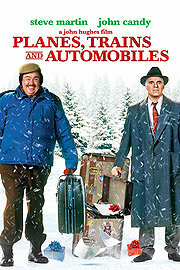 Planes, Trains, and Automobiles – Ok, so we’re in the top five, so I will curb my dark sense of humor that has clearly influenced the previous five entries…at least until number 2. It’s John Hughes again with the film that made Uncle Buck possible, which in turn made Home Alone possible. Although I’m sure the pitch meeting went something like this: “So John Candy and Steve Martin – SOLD!” the movie gives the two comedy icons plenty of material as they must reluctantly travel together to get home for Thanksgiving. I don’t care who you are – if you don’t tear up the first time you see the final scene, you’re not human! 4. 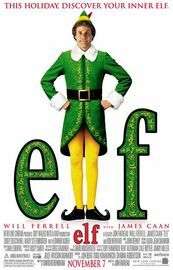 Elf – Perhaps the first of the modern classics, John Favreau directs Will Ferrell who plays Buddy the elf who was raised by Santa only to discover he is actually human. Favreau brilliantly balances the tone between silly and genius creating a film that is as enjoyable for children as it is for adults. Ferrell is joined by James Caan, Zooey Deschanel, and Bob Newhart who all contribute to this film’s success. This film has become virtually unavoidable, but it doesn’t mean it’s not good. 3. 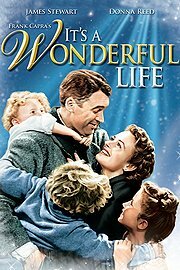 It’s a Wonderful Life – Not just a great holiday movie, but one of the best films ever made. Frank Capra’s crowning achievement finds Jimmy Stewart playing George Bailey who just can not get out of Bedford Falls. In a film class I took, a professor made a very compelling case for how this film fits nicely in the horror genre in a twisted, Twilight Zone kind of way. Nonetheless, the classic story about a man being shown what the world would be like if he never existed takes Dicken’s Christmas Carol to a new more relatable place where Scrooge is replaced by a nice guy who lets life get him down. 2. 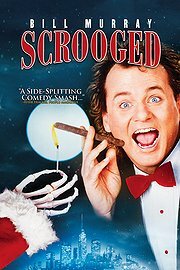 Scrooged – Ok back to dark comedy territory. I was told that for my “holiday movie list” Groundhog Day was not an appropriate title as the title “holiday movies” implies films that take place during or around November/December. I will agree to disagree, but fortunately, there’s an easy alternative – Scrooged! Bill Murray plays Frank Cross (“a thing they nail people to”), a TV executive who has let greed get the better of him. This film is a showcase for Murray as it would likely be terrible without him. However, because of him, it’s so good that it’s my #2 holiday film! On a side note – if you are looking for a Christmas-y Groundhog Day, it’s been brought to my attention that ABC Family created an absurd rip off called The 12 Dates of Christmas with Amy Smart and Zack Morris (Mark-Paul Gosselaar). Honorable mentions that didn’t quite make the list: The Nightmare Before Christmas, Love Actually, and Die Hard. The Golden Globe nominations were announced Thursday, and while I give them little credence they do potentially influence Academy Award voters who will begin submitting ballots shortly. My traditional rain on the Hollywood Foreign Press’s parade usually begins with their predilection to nominate big stars even when they are in trash (Angelina Jolie for The Tourist!? Really!). This year, I’m happy to announce that there are no undeserving nominees – in fact, the HFP even surprised me by not nominating Oprah in a year where they clearly could have as well as by not nominating George Clooney for his role in Gravity, which received buzz that I still can not understand! Unfortunately, the Hollywood Foreign Press still does not get away scott-free. This year, my tirade will be aimed at their motion picture nominees. 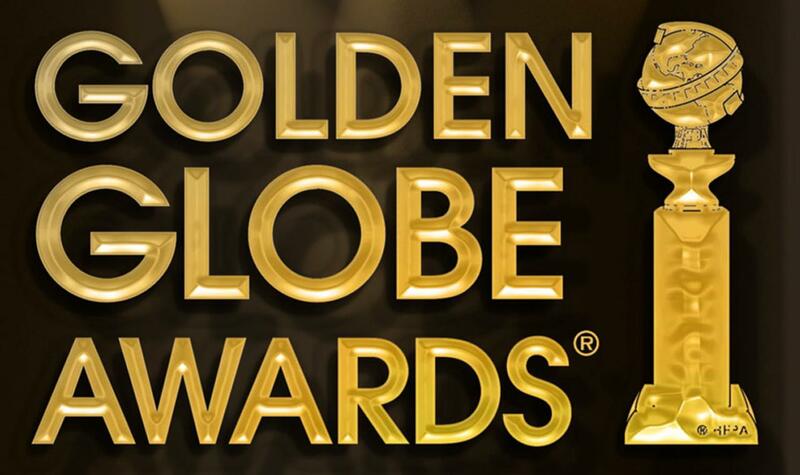 The Golden Globes has traditionally divided its best picture nominees into a comedy/musical category and a drama category. This practice is a fine trademark for the Globes as it widens the field and allows them to recognize some films that other awards leave out. This year the “comedy/musical” category includes films about FBI raids on Jersey mafia leaders, lonely men depressingly looking for unrequited love from inanimate objects, delusional, drunk fathers alienating their only sons, and corrupt stockbrokers defrauding investors. Hilarious, right! Inside Llewyn Davis aside, which I suppose could qualify as a “musical,” the HFP is simply using this comedy category to bleed “lighter” dramas onto the ballot. In fact, I heard that if Saving Mr. Banks were to have gotten a nomination, it would have been a DRAMA! What?! Tom Hanks as Walt Disney trying to get Mary Poppins made is a drama, but Martin Scorsese’s 3 hour corporate banking saga The Wolf of Wall Street is a comedy? Anyway, the nominees are mostly appropriate this year with few snubs and less pandering to red carpet mascots. 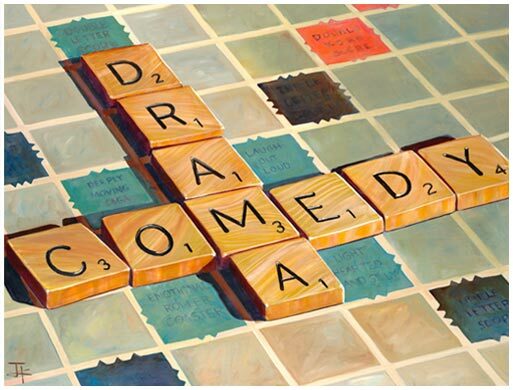 While, I refuse to take the quotation marks off of the Best Picture: “Comedy or Musical,” I am relatively appeased. A family member gave me the idea of putting together a list of the best 21 thrillers for the Halloween season. I asked her, why 21? To which she responded, “Because 21 is awesome,” so here is the awesome list of The People’s Critic’s top 21 Thrillers! 21. 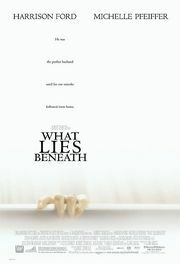 What Lies Beneath – Robert Zemeckis comes out of no where with a trippy, spooky ghost story that is the sole reason that The Others doesn’t make the list. Harrison Ford and Michelle Pfieffer begin to sense something is not right in their house leading them to explore the paranormal. While the ending may not satisfy everyone, this is a strong thriller worth seeking out. 20. 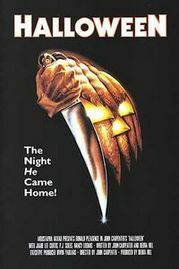 Halloween – This classic has took the slasher film from the periphery of popular culture and landed it smack dab in the center. John Carpenter’s story of a psychotic killer on the loose still sends chills down the spine, even after 35 years. Without Michael Myers, there would probably not be a Jason Voorhees or Freddy Krueger. 19. 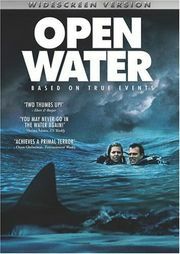 Open Water – This minimalistic independent film is one of the best explorations of primal fear I’ve ever seen. When two scuba divers are abandoned in the middle of the ocean with no apparent hope of rescue, they must rely on each other to battle the elements and hungry sharks. Supposedly based on true events, this film leaves you speechless. Avoid the sequel – at all costs! 18. 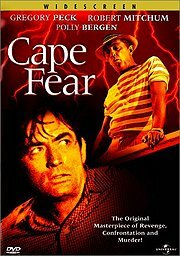 Cape Fear – While Scorsese gave it the old college try, there’s no contest between the update and the original 1962 film with Gregory Peck and Robert Mitchum. Mitchum is excellent as Max Cady, who emerges from prison after serving 8 years, only to terrorize the life of the prosecutor who put him away. Mitchum was born to play roles like this. 17. 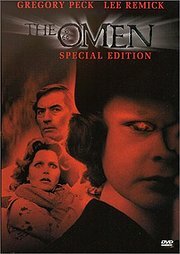 The Omen – Gregory Peck gets back-to-back placement on the list with an even better thriller, Richard Donner’s The Omen. Perhaps the penultimate “creepy-kid” movie, Peck and his wife Lee Remick become the parents of little Damien through a strange series of events. As Damien gets older, people start dying, and they pretty much don’t stop. What is a parent to do? Check it out and you’ll see. 16. Alien – Regardless of how desensitized we have become to John Hurt’s character Kane having an alien burst out of his chest, this film has far more to offer than just that. The saga that introduced us to Ellen Ripley heightens our fears to nightmare proportions and obviously has given us one of the most legendary movie monsters of all time. 15. 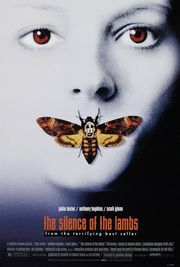 The Silence of the Lambs – Speaking of legendary, it doesn’t get much more legendary than Anthony Hopkins’ performance as Hannibal “The Cannibal” Lecter in Jonathan Demme’s suspenseful thriller, The Silence of the Lambs. This film just makes your skin crawl, and it plays games with your head in ways that only the finest thrillers can. 14. 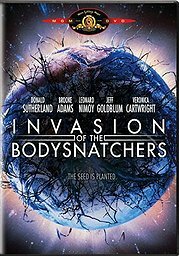 Invasion of the Body Snatchers – Unlike Cape Fear, I prefer the remake in this case. The 1978 film starring Donald Sutherland, Leonard Nimoy, and Jeff Goldblum takes this “pod-people” story to another level. The cameo made by Kevin McCarthy (who played Sutherland’s character in the original) verifies that this film is a deserving update. Strangely enough, another film higher up on the list is another Jeff Goldblum remake of a Kevin McCarthy film. 13. The Conjuring – This film represents the newest film to make the list. 2013’s The Conjuring, directed by James Wan, is one of the best horror films in some time. It is tonally an homage to the psychological horror films of the 70s and in fact can likely cite most of the next 12 films as inspirations. 12. 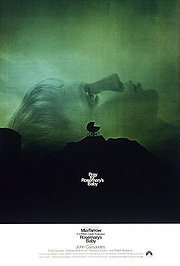 Rosemary’s Baby – Often cited as one of the finest horror films ever made, director Roman Polanski made his American film debut with the adaptation of Ira Levin’s world-wide best selling novel. Mia Farrow and John Cassavetes move into a New York apartment and find the other tenants taking a special interest in them. Most of the scares are subtle and work the imagination rather than obvious visuals. 10. Jaws – Here we are – the top ten. 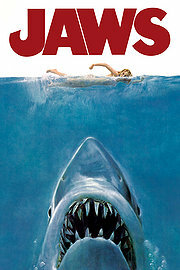 Surprisingly the second “shark” movie to make the list, Steven Spielberg’s Jaws invented the summer blockbuster and made everyone “afraid to go into the water.” Full of iconic characters and memorable lines, Jaws is a must see! 8. Zodiac – David Fincher is a director who I greatly admire, but has had tough luck figuring out how to end his movies. In his 9 major directorial jobs, he’s managed to have a strong ending maybe 3 times (and two of them are on this list). Zodiac is a focused, slow burn of a thriller. 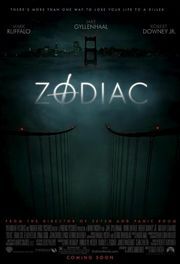 Fincher methodically recreates the mythology of the Zodiac killer and in the process makes a great film! 7. 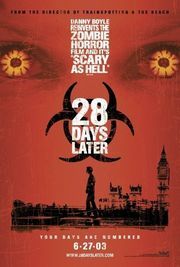 28 Days Later – Zombies are currently having their heyday (again), but what sets Danny Boyle’s 28 Days Later apart from the Romero-style “Living Dead” type movies is his frantic pace, making the film scary, fresh, and edgy. 6. The Descent – Director, Neil Marshall’s second film, The Descent, is a pillar of claustrophobic, B-movie greatness. But number 6? Yes! The Descent is great for how it “zigs” when many other similar films would “zag.” This is also a girl-power thriller, which is quite rare in this genre. The cast of 8 has only one male and that frees it up from all of the nutty clichés that often muddy up a good horror movie. 5. 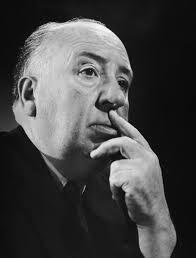 The Birds, Psycho, Rear Window, Vertigo – They don’t call Hitchcock the master of suspense for nothing. His films are of the finest forms of “thriller” and thus, rather than single one of his best out, spot 5 on the list is reserved for a quadruple feature that will not disappoint. 4. 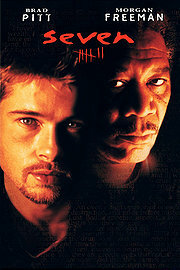 Se7en – Fincher’s second film on the list is Se7en; the film that answers the question, “What’s in the box?” Brad Pitt and Morgan Freeman investigate a serial killer who is murdering his victims in the style of the seven deadly sins. This is a tense and grotesque thriller with, of course, a great ending. 3. 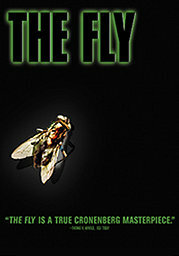 The Fly – David Cronenberg is a master of the disturbing. His film, Dead Ringers was an early candidate for this list; however, it is The Fly that is without a doubt in the running for best thriller ever. This 1986 remake of the 1958 original pours on the gore, but in a stunning and obsessive way. Jeff Goldblum believes he has devised a form of teleportation, until something goes wrong…very, very wrong. 2. 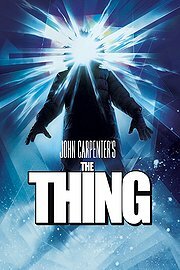 The Thing – John Carpenter nails it with his second film on the list, his 1982 remake of Howard Hawkes 1951 film, The Thing. This film was also remade again more recently, but what makes Carpenter’s film the best by far is the way Carpenter maximizes the paranoia and suspense. Kurt Russell is excellent as MacReady, an American helicopter pilot who arrives at a desolate Norwegian military base where he and his crew find themselves at battle with an alien foe that could be anywhere, or anyone! 1. 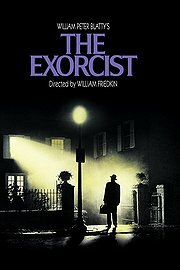 The Exorcist – I wish I could say that over the past 40 years, someone was able to take the crown from William Friedkin’s outrageously scary film, The Exorcist, but I’m afraid not. 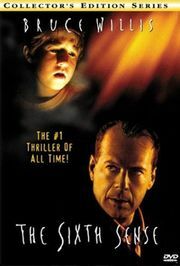 It was nominated for 8 Oscars, but that’s not what makes it the best thriller of all time. Friedkin went out of his way to create a film that worms its way into your subconscious in order to disturb you on multiple levels. When it was first released, it sent people, literally, running out of the theaters. Now, the trendsetting horror film can be viewed in “safety” of your own living room – where no one can see you run away! Turner Classic Movies is currently airing a tremendously interesting docu-series about the evolution of American and European cinema called The Story of Film – An Odyssey. It airs on Mondays and will consist of 15 episodes total. The most recent episode that aired discussed the 1930s and the introduction of sound into motion pictures. While the impact and effect sound had on the motion picture business is fairly well known, the series still manages to discuss the various uses of sound with the most impressive array of examples I have ever seen. 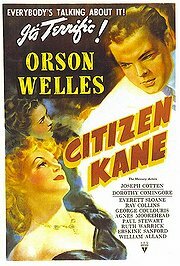 As a result, I am prompted to discuss my favorite use of sound from a film of this era, Citizen Kane. There is a shot midway through the film where Kane’s political rival, Gettys, is leaving the apartment of Kane’s mistress, now with the ammunition to destroy Kane’s chances in the race for governor. After this meeting, the contrast of sounds is crucial to the scene’s overall effect. In this shot the camera is placed above a spiral staircase directly above Kane’s head. Gettys is slowly walking down the stairs while Kane is wildly chasing after him and yelling at the top of his lungs. The loud booming voice of Kane is the dominant sound of the shot. The only other sound that is audible in the shot, is the faint sound of Kane’s footsteps as he frantically chases after Gettys. Gettys is completely silent. He walks down the stairs slowly and confidently. In the following shot Gettys is outside Susan’s building and Kane’s voice is silenced as Gettys shuts the door to the building. It is not important what Kane is yelling in this shot, but rather how his sound contrasts with Gettys’. Kane is loud and almost obnoxious. Gettys, on the other hand, is quiet and dignified. He knows he has beaten Kane and finishes him off by shutting the door on him, in effect silencing Kane as well as his political career. Another excellent use of sound occurs in the final scene where “rosebud” is finally revealed to the audience. Sound is very important to how well this crucial piece of information is finally revealed. The camera is placed behind a worker as he throws various material belongings of Kane’s into a giant furnace. At one point he throws a sled into the furnace and the camera begins to zoom in on the sled. As this slow zoom takes place loud screaming violins are heard being the dominant sound. 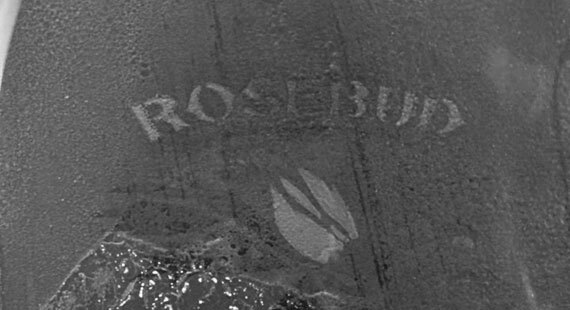 The camera stops zooming when the word “rosebud” on the sled is clearly visible. At this point the violins reach their highest pitch and a moving dramatic score continues. The piercing sound of the violins establishes a powerful emotional mood that produces a chill in the audience. The high pitch of the violins creates an uneasy mood as well. This high pitch contrasts beautifully with the low dark sounds in the following shot where we see the smoke coming out of the furnace chimney. This contrast results in a more compassionate and forgiving feeling about Kane.